Arriving about twenty minutes early for our 8pm reservation, I found my dearest chum, Susanna already a cocktail to the good and the best part of halfway through a bowl of excellent roasted broadbeans in the bar area of GALVIN AT WINDOWS. On the 28th floor of The Hilton on Park Lane, the view is spectacular, particularly when one looks East towards The Gherkin and Canary Wharf. So, I was more than happy to sit a spell and enjoy a splendidly made Martini with just the right slick of lemon oil across the top before we headed to our table. 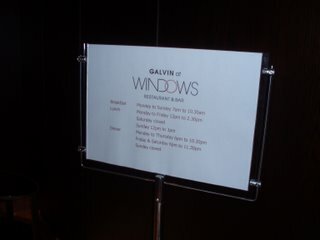 We were not seated right by the windows as I had requested. 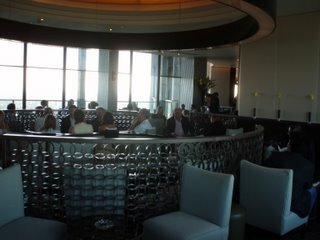 However, like London’s other elevated dining room, Rhodes 24, the view is splendid from where ever you sit. Although, given London’s shameful lack of tall buildings, it did take me a while to figure out where the hell I was looking. Still, geography lesson over, we settled back to look at the menu. There is a Menu Gourmand at £69 ( £95 with the wine pairings ) and the a la carte prices range from £12-14 for starters to £25-30 for main courses. Pretty steep going and evidencing the intentions and aspirations of the kitchen. As, indeed, did our amuse. 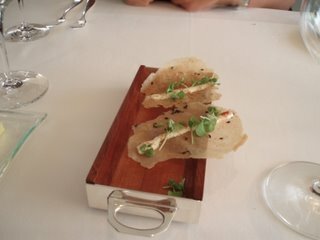 A thin filo base with a sliver of foie gras mousse topped with micro basil. Each flavour coming through loud and clear. Which is more than can be said for the bread which was cold and tasteless even though they assured us they cooked it on site. Not something I would boast about, guys. 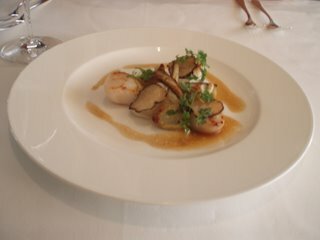 To begin, Susanna went for Scottish Scallops with baby artichokes and puree of the same and a truffle dressing. She was disappointed and she was right. It was fine. The scallops were fresh and cooked perfectly but the dish was unmemorable. I have a lurking suspicion that all scallop dishes are, by their very nature going to be unmemorable. They are just not that exciting. Much, much better was my choice. 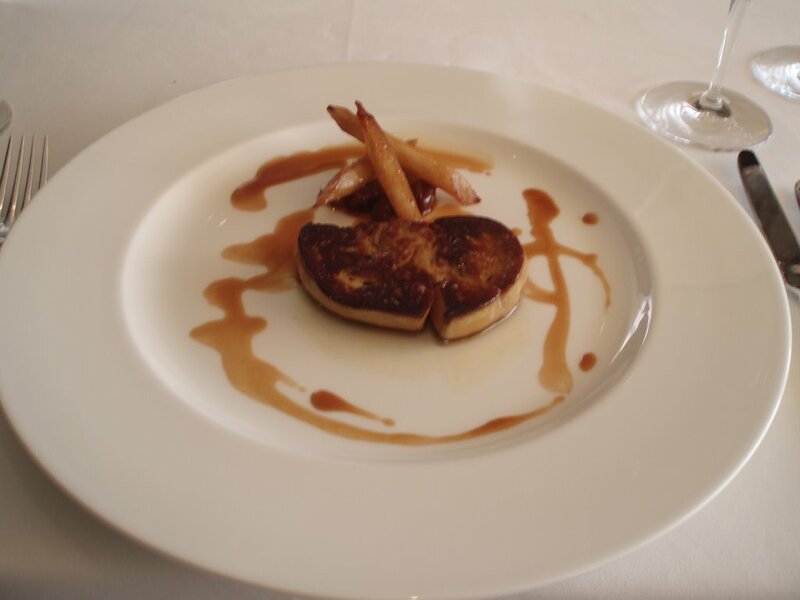 Seared foie gra with roasted salsify, raisin moelleux and a sauternes jus. Excellent and not just because of my love of all things foie. This was a brilliantly composed dish with the slight acidity of the salsify cutting through the fattiness of the foie which was crisp outside and liquid like inside. As good a dish as I have tried this year. Unlike so many of those in London who wear the little badge of grapes with noxious indifference, the Italian sommelier at Galvin was delightful. Enthusiastic and charming he made a number of recommendations all of which were bang on the money and on the budget. To begin, he recommended a Leitz Riesling to go with my foie. With the sweetness one expects from a Spatlese and a noticeable frizzante it complimented the dish well. For Susanna, he recommended a Condrieu which had the slight steeliness that I like in Viognier which suited the dish but lost any appeal when we were sipping what was left without the food. For main courses, I got the better of the deal again. 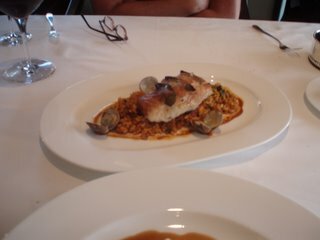 A braised monkfish with shrimps and clams came on top of a perfectly made paella littered with toothsome chorizo. 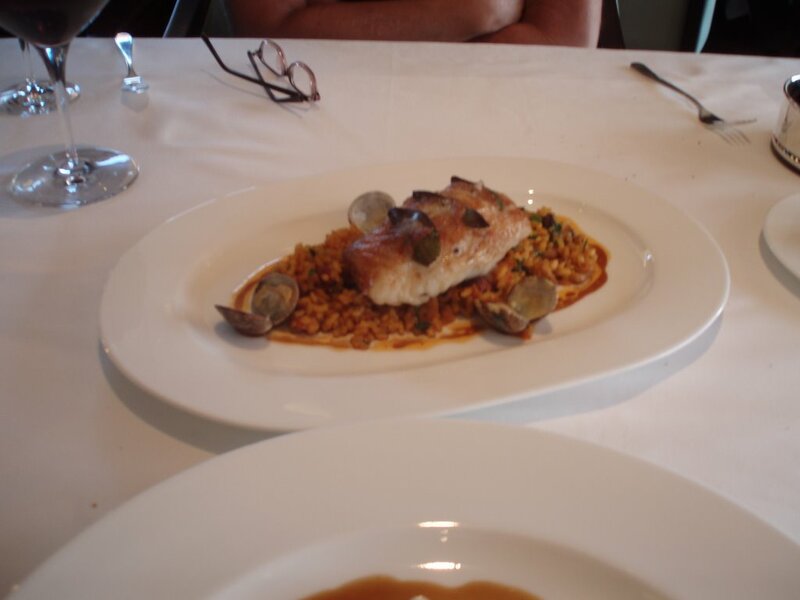 Unfortunately, the monkfish was slightly overcooked and had dried a little which is a dish costing £28 is pretty unforgivable. The bomba rice had plumped beautifully with the saffron stock though and a bowl of that would have suited me down to the ground. My choice was again offally good. 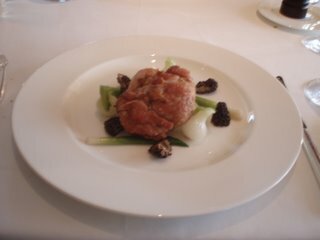 Veal sweetbreads, braised lettuce, grelot onions and morels. Another spot on dish of glandy goodness. The sweetbread was a large chunk cooked perfectly with a slight outside crunch and a giving centre ( a lot like me really ) each accompaniment was just right. The onions were braised then roasted and sweet as a Thierry Henri backheel. The braised lettuce was another item that could have easily been a solo supper if cooked at home. Best of all, though was a small copper dish of pommes mousseline. I don’t eat a lot of potatoes, but we practically came to blows over these. 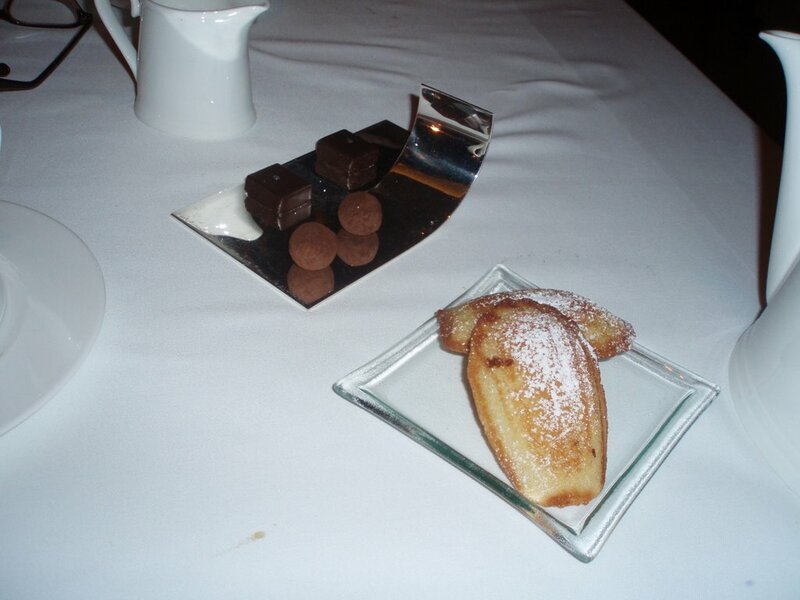 With our main courses, the sommelier suggested a Moulin A Vent which he chilled ever so slightly before opening. At first, it tasted of nothing but opened up stunningly in the glass and suited both dishes ably. 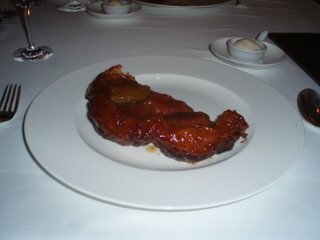 For pudding, we split a Pear tatin which was very enjoyable but should have been at £8.50 a pop. Two sauces ( cream and caramel ) and a calvados crème fraiche was a bit of an overkill but Susanna called the tatin “ the best I have ever tasted” which is something coming from someone of her experience in fine dining. I ordered a glass of Cypres De Climens with my pudding and the sommelier comped us a glass of Muscat. Tea and coffee was £4.50 a pop which is about average for London these days. It came with a small plate of Madeleines and two petits. Shamefully though, a refill of pretty ordinary filter coffee was charged at another £4.50. The final bill was a nosebleed inducing £236 including service charge which was thoroughly deserved for what was charming and professional attention from beginning to end. Was it worth it? I am still pondering on that. Excellent cooking from a kitchen with real ambitions, for sure and in a very special location which, I know, adds to the cost. But, that is a hell of a lot to pay by most people’s standards and relegates this to a “special occasion” and corporate dining place.